Pastor Bob Sanders has been caught up in the nightmare of America turned into an Islamic nation. Imprisoned for his faith, he endures the ultimate test as a follower of Jesus Christ: intense persecution and suffering. Sanders’ captors declare he must convert to Islam or die. Meanwhile, Pastor James Glazier travels at God’s direction preaching the Gospel and warning of His imminent wrath. In the midst of many trials, he risks his life and the lives of those he loves to bring his prophetic message to those who least want to hear it. Because God is sovereign, He has many surprises in store for both His disciples and for those in opposition to His will. Sow the Wind was the first book in the planned Whirlwind trilogy. 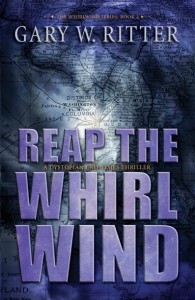 Reap the Whirlwind is the second book in the series. “I can’t explain it, sir.” Trask had feared this day as he’d witnessed many homosexuals and atheist militia prisoners become Christians. His charge from Colonel Hussein was perfectly clear: Do whatever it takes to turn the men and women in the camp into good little Muslims. Women in their separate quarters hadn’t declared Jesus Christ as their Savior in anywhere near the numbers of the men. Presumably the infestation came from within the male contingent. Air Force One flew high above the war-torn city. It didn’t matter what altitude they tried on the flight over, roiling storm clouds had made the flight a rocky one. Ibrihim Sufyan would have liked a closer look over some of the more devastated sections, but with President Abu Saif on board, such an action was imprudent, particularly with the driving rain propelled by gusts of gale-force winds. Toledo, on the eastern edge of FEMA District 3, had been particularly difficult to bring under the control of the new Islamic government. It was one of several cities that had resisted and were involved in armed opposition conflict against numerous allied militia units. Today the president and his aide planned an on-the-ground examination and assessment. It was somewhat unusual for the president to come along on reconnaissance of this nature, but that morning he’d insisted. It was only later on the flight that he’d confided in Sufyan his reason for coming. The pilot had instructions to land in a safe zone outside the city. Regardless, Sufyan worried that the rebels might see their aircraft and attempt a spontaneous offensive. They had a seemingly inexhaustible supply of military grade weapons, including rocket-propelled grenades and .50 caliber firearms. The RPGs could easily take down a plane in flight and were being used by the militia to great effect in their insurgency. This airfield for government forces had been shelled numerous times and patched repeatedly to enable large birds like Air Force One and others to make necessary landings. There was a constant need to ferry in more troops and supplies against an enemy who wouldn’t quit and continued to hold out despite the constant effort to eradicate them and bring them into submission to Islam. Once off the plane, the two men ran for cover into an armored Hummer and soon met with the general in charge of the Islamic forces, Walid Jabbour. General Jabbour saluted and stood ramrod straight with eyes focused in the distance at the introduction to President Saif. Great rolls of thunder rumbled overhead. Sharp spikes of lightning charged the sky outside. Rain pelted down against the windows so hard that Sufyan wondered if it might break through the glass. Standing next to his boss, Sufyan saw his muscles tense and his fingers twitch. He knew trouble was coming, as he’d seen this same response a hundred times before, never with a good result for the one who curried Saif’s displeasure. “I agree, Mr. President. This man obviously cannot lead his troops.” They discussed the situation for several minutes and returned to where General Jabbour stood with an unhappy expression on his face. Over the next several hours, they promoted the next in command after assuring themselves that his attitude would be superior to that of his predecessor. Late in the afternoon, they headed back to Air Force One in the reinforced Hummer. If possible, it seemed as if the fury of the storm had actually intensified. Just as they were about to board for their flight home, Sufyan heard the whistling overhead of an incoming RPG and scanned the sky in alarm.